When Billy spots a beautiful, big, stripy balloon in the park one day, Mommy buys it for him. But Billy doesn't manage to hold on to it for long, and soon he and Mommy and Puppy are chasing it all over the park. 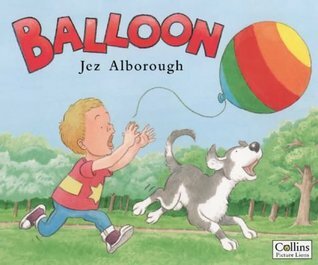 This charming story of a little boy's adventure in the park is told in a rhythmic style that can't fail to keep the reader turning the pages with the momentum of tWhen Billy spots a beautiful, big, stripy balloon in the park one day, Mommy buys it for him. But Billy doesn't manage to hold on to it for long, and soon he and Mommy and Puppy are chasing it all over the park. This charming story of a little boy's adventure in the park is told in a rhythmic style that can't fail to keep the reader turning the pages with the momentum of the chase. Accompanied by the author's endearing illustrations, young children will want to return this to this book again and again.